Pedaling for Pancakes: Driving an Internet scammer crazy, one pancake at a time! Over the years, I’ve met some interesting people online. I’ve negotiated a contract for 50 000 comfort bikes with a scammer claiming to be the former Prime Minister of Cameroon. At the request of a supposed Reverend from Kenya, I’ve arranged for the transatlantic shipment of a treadmill on wheels attached to a hot dog vending cart. While those exchanges did not lead to the financial windfall that was promised, they did cultivate my interest in imaginary business deals. As luck would have it, it wasn’t long before I was presented with another exciting opportunity. Thank you for writing. The Bicycle Forest is a company that rents out a wide variety of human powered vehicles. We are based near a community trail, which is nice. However, there are gates across the entrance to the trail which prevent some of our wider bikes from getting through. It has long been a dream to acquire a larger plot of land where people could ride our bikes on a purpose-built trail. $12.8 million dollars would certainly go a long way to realizing this goal. Let me know if you think we’d be a good fit. With thanks acknowledge the receipt of your mail and the content fully understood, I want you to take into account that in order to be successful in a transaction of such magnitude we have to be objective and practical from the very onset to the actualization of our set goal, if not we are just going to end in a neutral position due to lack of trust and overprotection. I would like to intimate you with certain facts that may be of interest to you, I am presently working with the Ministry of works and housing here in Ghana and I acquire the funds from gold and diamond deals that I did with an Indonesian investor, who is also a contractor to the Govenrment of Ghana, My reason for taking this line of action borders on the fact that government official in my country are not permitted to operate foreign investment that is visible due to the civil service code of conduct. that is why I would want this transaction to be confidential because I am masking my involvement in the proposed investment in your country. With respect to the type of investment you explained, I am interested in putting my funds into joint investment with you but we need to setup a memorandum of understanding binding both of us in this transaction and how funds and profit will be distributed. Presently the funds are deposited in a security finance firm under a discreet arrangement here in Ghana so for you to take possession of the funds for our proposed investment you will need to be here personally to meet with the officials of the finance firm and sign all the releae documents before transfer can be made, first I am going to introduce you to the firm as the beneficiary of the deposit in a written letter and the due process must be followed to adequately protect us from breaching local and international laws. With these information I will write a letter of authorization to introduce you to the firm currently holding the deposit to start up the process of fund release to you. Please contact me with your response if you have any questions so that we can mutually make meaningful progress. I did not respond immediately. So the next day, Dr. Kofi wrote again. Since our last communication, I did not hear from you again, Sincerely speaking, I hope I did not do or say anything to give you second thoughts about this project that we were supposed to collectively prosecute successfully for our mutual benefit. I am deeply concerned, because having revealed myself and my strategy of getting these funds safely into your possession, it seems you have decided to abandon me midway, and thus put me in tight corner because, it is quite easy to be compromised and our objective truncated by a word dropped in the wrong place. I implore you to get in touch with me ASAP, via email so that we can examine, together, any gray areas, in order for us to make meaningful progress, I need to hear from you again before I can proceed to write my report. please email me back. I am looking to your reply, till then remain blessed in the Lord. In the interest of keeping this imaginary business deal strictly imaginary, I knew I’d have to come up with some stall tactics if I wanted to put off the inevitable request for my banking details. The solution I came up with was to put myself in the middle of an imaginary cross country charity bike ride. To bolster this illusion I created several heavily doctored photographs. I’m very sorry for not responding sooner. I’ve actually been on the road all this time. My partner and I are riding our pedal powered truck across Canada to raise awareness for the decline of sugar maple trees. This has been a hard journey. 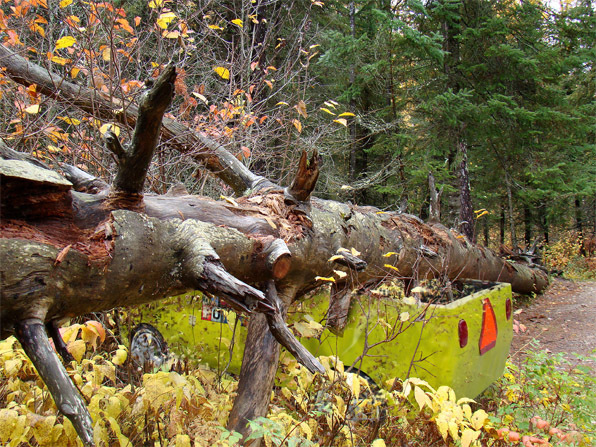 Our truck is so heavy that we are usually only able to ride about 50km per day. We generally try to camp near the edge of towns. In the morning, we try to pedal into town and cook up a pancake breakfast to share with people as they pass by on their way to work. We use only pure maple syrup on our pancakes. The idea is to remind people about how delicious maple syrup is. It’s sort of a shame, but it seems like people don’t see the value in a healthy forest for the sake of the forest alone. People always need to know how it affects them directly. Well, the sugar maple is lucky in that regard. Everybody loves maple syrup and when you tell people that all the maple syrup will soon be gone, they really listen. Of course, some people think they’ll just get by with table syrup. However, table syrup is made mostly of high fructose corn syrup and when you try the two side by side as we encourage people to do at our free pancake breakfasts, there’s really no comparison. Anyways, during this trip, I have limited internet access and do not have a phone with me. Therefore, I can not be reached by phone, but if you give me your number, I can call you from a pay phone. 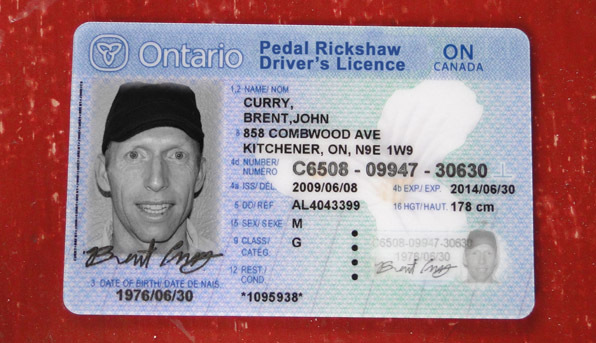 I’ve attached a photo of my pedal rickshaw driver’s licence which includes my contact info. My occupation is currently pedal rickshaw driver. But as I mentioned in my last e-mail, during the summer, I also have a bicycle rental business which I would like to see grow through your generous support. I should let you know that I am absolutely thrilled to hear about your investment proposal. I regret that I may not have regular Internet access in the coming weeks as I complete my pedal powered truck trip across Canada. However, please do let me know what more you require from me and I will do my best to sort things out at my end. On another note, our fundraising goal for our trip is one million dollars. At this point, we have raised about $12 750.00. I do expect that donations will pick up as we near the completion of our trip. However, we still have a long way to go. If there is a lot of work for me to do to get this investment underway, perhaps it would make sense for a portion of your investment to go towards our one million dollar fund raising goal. That way, we could finish our trip now and devote our full attention to your investment proposal. Let me know what you think. Again, thank you very much for this opportunity. I very much look forward to working with you soon. Thanks for your mail to me, I actually thought you have abandoned this project until I saw your mail that you are still willing to partner with me. I read your mail and equally understood the content but there are some fact I would like you to note with respect to this transaction so that you can give it attention as time and lack of proper communication can jeopardize this arrangement. third party without my consent please adhere to this fact. I deposited the funds under a discreet arrangement with a finance house in Ghana before I left, because there is no way I can move out with that quantity of funds.But I am always in touch with my account officer at the finance house keeping me inform with all developments.The basic reason for the action to invest the funds under your direct supervision is because, I do not want to wake up one day and find out that the present government has been able to locate the funds and confiscate it. This will not happen if I have my way, hence I seek your sincere support to stand and claim the funds for mutual investment and mutual benefit. At this point wasting further time could be detrimental to this arrangement, now that you have given me your information I will swing into action to write a letter of authorization to release the deposit to you as the beneficiary. I will send you copies of the letter of authorization and a sworn affidavit of change of title from my name to your name as the new beneficiary to empower you to claim the deposit. Furthermore I am willing to support your donation/fundraising project but how will it benefit me? My friend and partner, endeavour to always check your mail daily for us to close distance with constant communication and effective handling of this matter, my telephone number is +233268441099 I put it on periodically but I always check my mails daily. Good to hear from you again. The Pedaling for Pancakes tour has just pulled into Kootenay National Park. The riding the past few days has been brutal. We’re really feeling the weight of this pickup truck on the hills. I’ve attached a photo to show the kind of terrain we’re riding through. On some of the steeper passes, we’ve simply had to get out and push the truck up the hill. As you can see, the bed of the truck is loaded with supplies for our daily pancake breakfasts. We made a decision back in Canmore not to carry any non-pancake related food through the mountains. I’m starting to regret that decision. It’s now three days later, and I haven’t eaten anything but pancakes this whole time. Trying to sound real enthused about maple syrup as we serve pancakes to passing motorists is getting harder and harder. Sometimes, I feel like I’m going to be sick if I eat another pancake, but then I get hungry again, and well… what can you do? Thank you for your willingness to consider donating to our project. I would never have asked you for such a large sum if it weren’t for the circumstances. 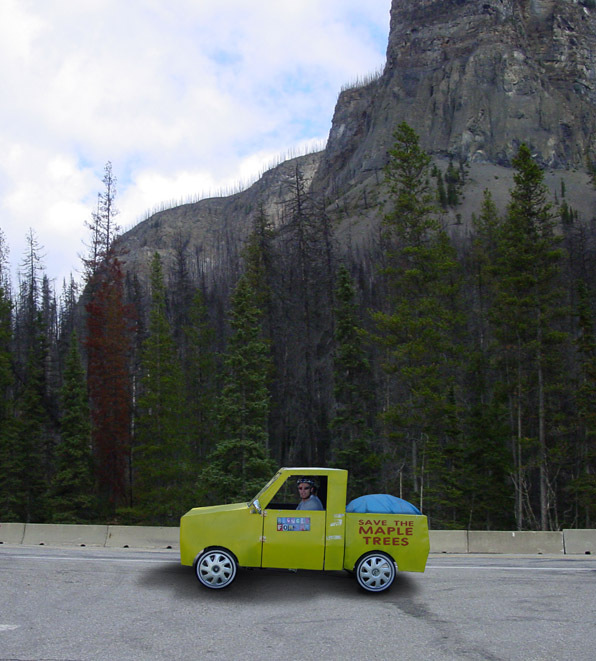 You see, it will take us at least another three weeks to finish our cross Canada pedal powered pickup truck ride. As long as I’m on this trip, I will not have much time to devote to your investment proposal. If your proposal is of a time sensitive nature I just thought it might make sense for some of your money to go towards our fundraising goal, so that we can wrap this trip up early and really give your investment proposal the careful attention it deserves. Of course, besides freeing up my schedule and saving me from three more weeks of an all pancake diet, you would also be helping to save Canada’s maple forest ecosystem, truly one of our most precious natural resources. 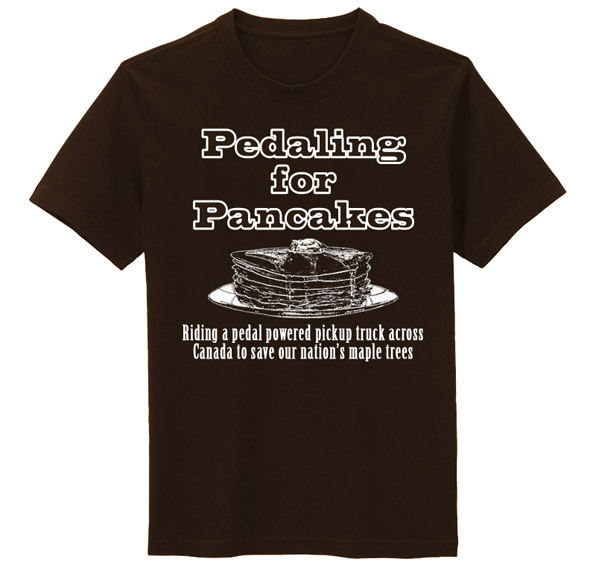 Also, as a valued donor, you would receive one of our custom Pedaling for Pancakes T-Shirts. I hope you will give this idea favourable consideration. If you have any documents you need me to sign for this proposal, I would suggest that you e-mail them to me as I will not be at my home address for another few weeks. Thanks for your mail to me, I read your mail, saw the T.Shirt and the piture of the truck you sent. I am very impressed at your decent initiative towards the sustainance of the Marple trees in your country. Nothing good comes easy you might be facing difficulties here and there eating pancakes daily but with determination and perseverance you are sure to reach your expected destination. I have no doubt in my mind that if I entrust you with my funds it will be invested wisely. I have agreed to support your fund raisng program but first we have to think of getting the money out of the bank in Ghana to your country before you can have my financial support. As it stand I am not the one delaying the process of this arrangement rather you are, because you are into a time consuming program which must come to an end before you fully give me the desired attention. In my previous mail I told you to always devote 10 minutes of your time to check the internet for any message from me and with that pace we can end up achieving two things. With this position, I have written a letter of authorization to the bank to reconcile the papers and transfer the funds to you as the beneficiary.a scan copy of the letter is attached to this mail, Immediately the bank contact you reagarding the funds please keep me posted with all communications so that we can move in unison towards success. I hope you are well and OK? I sent you mail with the letter of authorization attached, kindly acknowledge my mail and let me know if you have been contacted by the bank regarding the release of funds to you. Believe it or not, I was actually busy with some real work, so I didn’t get back to him for a few more days, but here’s what I wrote. I’m so sorry for the long silence. I’ve just been through the most harrowing experience of my life. When I last wrote, we had just arrived at Kootenay National Park. I was pretty sick of eating pancakes. But all things considered, everything else was going relatively well. Since we’ve been riding through bear country, we’ve had to take precautions with our food supplies. They recommend either storing food in bear bins, or hanging it from a tree. On our first night in Kootenay National Park, there wasn’t enough room in the bear bin for all of our pancake mix, so we decided to hang it from a tree. Our food bundle was so heavy we had to use a winch to hoist it off the ground. Just as we got the food into position, we heard this loud cracking sound. The trunk of the tree split apart at the base and the whole tree came crashing down on our pickup truck. I’ve attached a photo of the wreckage. As you can see, we had our work cut out for us in getting our truck out from under there. We ended up staying the night at a lodge and decided to take the next day just to regroup and get ourselves ready for the following morning’s pancake breakfast. We wanted to use up a lot more of the pancake mix to lighten our load for biking and also to mitigate the bear threat. So we ended up spending all that afternoon just cooking pancakes. 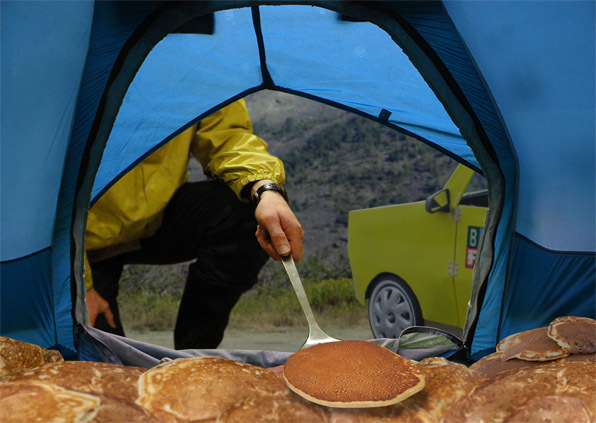 We stored the pancakes in our tent as you can see in the attached photo. That night, we covered the pancakes in a plastic sheet and lay down on top of them. The pancakes were still warm from the pan, so I have to say, after all the stress of the past few weeks, lying down on that bed of pancakes was like heaven. While I might have fallen asleep in heaven, I woke up in hell. I was probably having the deepest sleep of my life when suddenly my head was buried in this bear’s armpit. A bear had torn through the side of our tent and was furiously ripping at the plastic tarp that covered our mattress of pancakes. If there’s one thing I can be thankful for it’s that the bear was a whole lot more interested in the pancakes than he was in me. As soon as the bear shifted its weight, I slid out from under it and ran as fast as I could until the bear was completely out of site. Unfortunately, all my ID and money was back in the tent. So in the morning, after spending a sleepless night wandering around the campground, I went back to check out the scene at my tent. My partner was there as well. We watched the bear from a distance. But all day long, the bear was either chowing down on our pancakes our sleeping on top of them. The ranger told us there was nothing he could do to remove the bear, so he invited us to stay at his cabin until the bear finished with our pancakes. I couldn’t believe how long that bear took to finish off all those pancakes. The bear only left this morning and it was only a couple hours ago, that I was able to go back there and retrieve all my valuables. Needless to say, the Pedalling for Pancakes tour has been seriously derailed. I’m sorry I haven’t filled out that form yet. I intend to do that ASAP, but first I have to e-mail the rest of my friends and family and let them know that I’m okay. We’ll also have to decide what its going to take to get our charity tour back on the road. I’m sorry, I can’t say more right now. I’m just feeling very frazzled. Rest assured, I’m still very excited about your investment proposal. Again, if we could take some of that investment and put it towards wrapping up this trip, that would be a huge load off my mind. Dr. Kofi’s response came swiftly. How are you today? so good to hear from you after few days, I was actually worried that in our last email communication that I said you should always check your mails daily for constant communication since you do not have a phone to reach you. I equally saw the wreckage done by the tree well. I am so thankful to God my partner and friend for what he has done for you saving your life from that bear. imagine the way the bear would have devoured you if it had noticed your presence but, God so kind he drew the attention of the bear with the pancake so do not complain about eating the pancake any longer as it has saved your life. Now lets get down to Business, I sent the bank the letter of authorization which I also sent you a copy to process the transfer of funds to you, I have contacted the bank several times they told me they have sent a message to you but still have not heard from you. Please check if the bank has communicated any message to you and forward a copy to me so that we can collectively take a dicision. In my previous mail I made it clear that I am willing to support your fund raising program, but at the moment we need to focus on getting the funds out to your bank safely before further action can be taken towards giving you a helping hand. I want you to note that my word is my bond both in business and personal affairs, and I am dedicated to only engaging in transactions that benefit all parties involved. If our goals are clearly defined and we are committed to those goals we will realize unparalleled success both now and in the future. I am personally looking forward to creating a prosperous enterprise for all of us. God bless you. 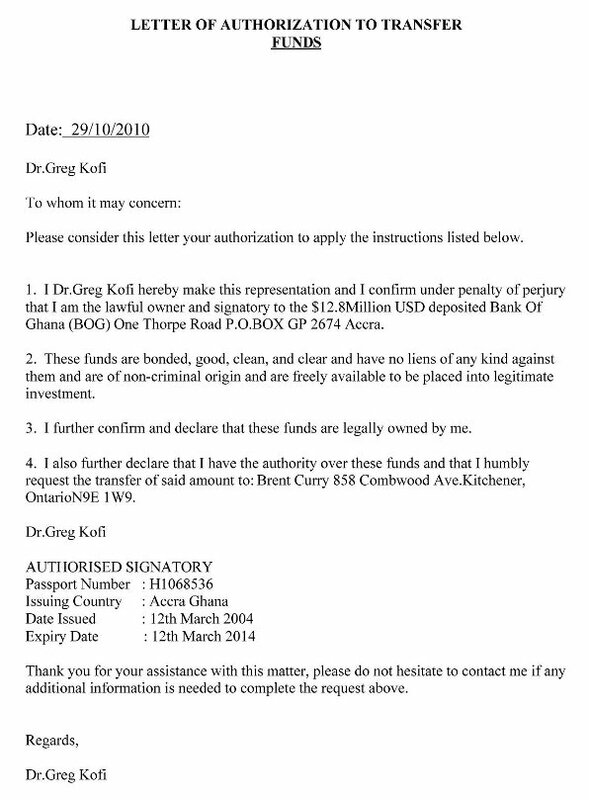 I wasn’t sure what Dr. Kofi’s angle was with that letter of authorization. No bank had contacted me, so I pretended to take matters into my own hands. I claimed to have taken the letter into my own bank. 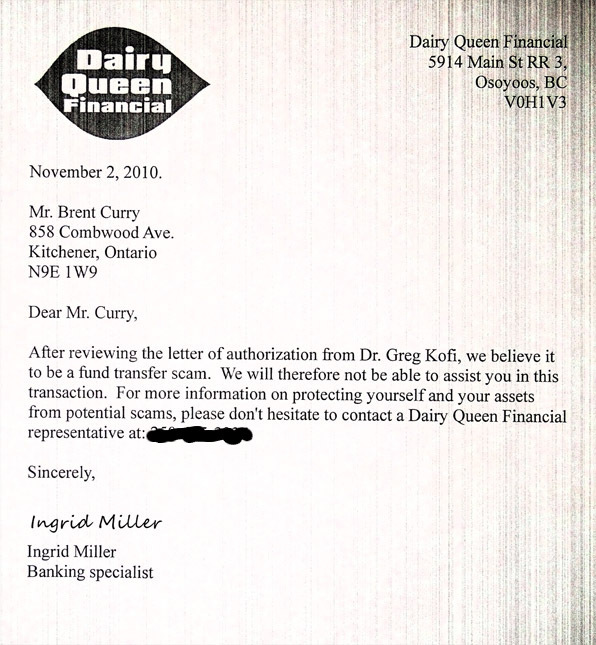 Of course, like any self-respecting Canadian, I do all my banking with Dairy Queen Financial. Thanks for the kind words regarding my episode with the bear. The experience has certainly taught me to be thankful for my health and just the simple fact that I’m alive. Unfortunately, I’ve had some correspondence with my bank and they seem to think that I’m trying to scam them or something. I’ve attached a photo of the fax they sent to my campground in Invermere yesterday. I don’t know quite what to make of it. I don’t know if they think I’m making you up or what. I wish they would have given me a chance to explain all the correspondence I’ve had with you so far. I just think that if they took the time to read all of your e-mails, they would see what a thoughtful and compassionate person you are. I wonder if I went back to them with more information about you if they might eventually come to trust you like I do. If you think this might help, could you please send me a photo of yourself, maybe a picture that shows you working as a doctor. I could take that back to the bank maybe with a longer resume of your accomplishments. If you could send me that, that would be greatly appreciated. I’m still very interested in helping out with your investment proposal, just frustrated at the moment by the road blocks that my bank is throwing in my way. Thanks for the mail you sent and the copy of fax sent it was carefully noted, well the only thing I have to tell you is that in one of my previous mails I told you about my sensitive position and would want the transaction to be confidential and I further advise you not to tell anybody about this transaction without my consent. Your bank can setup an investigation to my country and can jeopardise this whole arrangement and put me in a serious mess. I graduated from college of medicine Legon University Kumasi but did not practise medicine I went into politics. I am just giving you a breif of my profile but will not continue this transaction with you any longer, because if you give your bank all our correspondence they will trace me through the Canadian Embassy here in Ghana and nail me destroying my career. I will only proceed on one condition that you stop relating issues regarding the transfer of this funds to your bank or individuals that can bring me to ruin because of my investment plan. I already told you that we government officials are not permitted to own foreign investment that it is against the civil service code of conduct.anybody found in that singular act will face the terrible judgement of the law court. If you can assure me of confidentiallity I will proceed, infact I have placed a stop order on the transfer process till we come to agreement. Brent, if I have to release funds to you for our proposed investment and supporting your fund raising program I am not doing a wire transfer because your bank will monitor your bank account and note if there is any change in your account balance that can also raise unfriendly eyebrow. The only method I can employ to reach and entrust the funds to you,is to use secure delivery of the funds to you by parcel experts companies that undertake task that involves delivery of valuable products to individuals that need immediate access to cash through their secure services. Please ponder on what I have explained to you and get back to me, if you agree to work with me I will scan and send a copy of my international passport to you as a security for you to have a sense of tangibility and not just an email address that I appera to be in your memory. I’m very sorry to have put you in jeopardy when I consulted with my bank. I guess I misunderstood you, but I thought I was supposed to take the letter of authorization to the bank to initiate this investment. I promise from here on, that I will keep my communication with you strictly confidential. Please proceed with whatever steps are needed to get this investment off the ground. Willy and I are still riding westward on our Trans-Canada pedal truck trip. 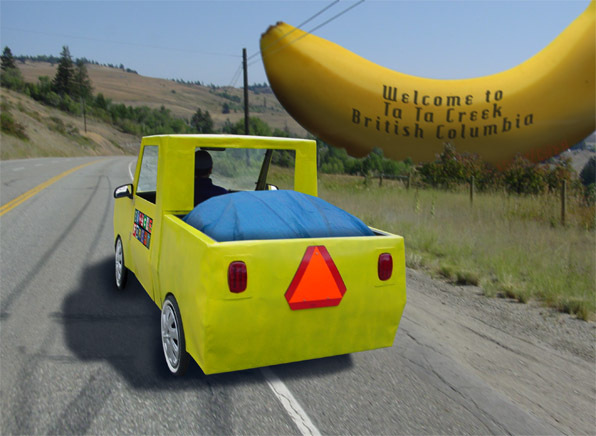 Here’s a photo from Ta Ta Creek, British Columbia, home of the world’s largest banana. I got your mail and equally understood your concern, your action was not intentional to tarnish my image. Since you have agreed to keep all our communication in perfect secrecy I will proceed with the necessary arrangement to get the funds brought to you in Canada. I have instructed the bank to get the shipping agents informed about the new development that you desire the funds to be packaged and delivered to you in Canada at your home address. With this position, they will need a direct telephone line to reach you as soon as the delivery agent arrive Canada, considering the incident of September 11, security cheks have been intensified in various country borders so, immediately they are able to cross into Canada they will not want to waste much time to deliver the consignment to you as the beneficiary so that you can sign the proof of delivery document. I will get back to you after finalising the delivery arrangement with the bank and what is expected of you. Attached to this mail is a scan copy of my international passport as promised. A Google image search for passport number H1068536 reveals dozens of counterfeit passports using the same number. Please respond timely so that we can conclude this deal quickly and start our investment. Thanks for your patience with me. I’m glad that we are still going to be able to work this out. Unfortunately, it looks like Willy and I will be on the road until about the end of November as we complete our cross Canada pedal truck trip. I will not be reachable by telephone until after that time. In other news, our fund raising project has just scored another major sponsor! The International House Of Pancakes has just pledged $4000 towards our efforts to protect Canada’s maple forests. In addition to this, they’ve provided three lifetime memberships entitling us to free pancakes for life at any IHOP restaurant in North America. Willy and I have each claimed a membership, and we both agreed that the third membership should go to you. In order to register your membership, the people at IHOP just needed a piece of ID. We figured since we already had a copy of your passport, we’d surprise you by getting your membership processed straight away. Much to our surprise, the person processing your membership found that they already had an individual named Samuel Banks registered with your exact Ghanaian passport number. Because we had a copy of your passport, it was obvious to everyone that you are the rightful owner of that passport number and that Samuel Banks is a fraud. This was even more obvious when investigation revealed that for the past three months, Samuel Banks had been ordering an average of $78 per day in pancakes at IHOP restaurants in Northern Florida, Alabama, Mississippi and Louisiana! 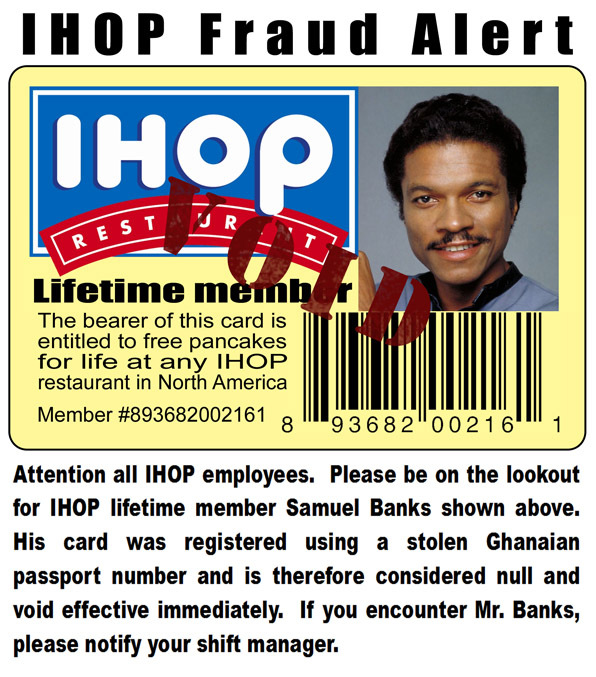 IHOP Restaurants is taking this seriously and is doing everything in their power to apprehend this Samuel Banks character. The attached notice is going up in all IHOP restaurants across the Southeastern United States. In the meantime, IHOP also assures me that there should be no trouble for you to pickup your membership card at any IHOP restaurant in North America. Simply present yourself at the counter with your passport and let them know that you are there to pickup your lifetime membership card. I realize that you may not travel to North America too often, so I’m trying to see if there is anything they can do to make your membership valid in other parts of the world. I’ll keep you posted on what I find out. Today, we are in Kimberley, British Columbia. It was a long hard climb to get up here, so we’re thinking about taking a rest day here before heading down into Cranbrook. I’m sorry that this trip is preventing us from fully focusing on your investment proposal. However, let me know if there is anything I could be doing at my end while I’m on the road. Thanks for the mail to me, I hope you are doing great and enjoying the pedal truck trip? I am really impressed with your initiative. I saw the fraud alert noticed you attached to your mail, I don’t even know what to say about the guy and why he should impersonating to that extent. With respect to you offering me a membership with IHOP I am indeed thankful to your kind heart this is to show that when we eventually start our joint investment my funds are in safe and trusted hands. Since you will be on the road until about the end of November to complete the cross Canada pedal truck trip, I will advise you to let me know if there is anybody you can trust in your home to recieve the consignment and keep it safe until you return to your home. If you cannot guarantee the safety of the consignment in your absence then we shall delay the delivery pending your arrival at your home address to recieve it personally. Meanwhile, I have advised the firm to process all shipping documents and soon they will contact you to get more details from you to enable them discharge their duty perfectly. I await your earliest mail, Please make sure you keep me informed with all developments from your end as usual and do feel assured and partnered. There is nobody at home to accept the shipment yet, so we will have to put things off until my return. We encountered a freak snow storm the other day and are still holed up in Kimberley. When the roads are clear, we’ll have to really push to get this trip done before winter sets in again. I’ve heard back from the people at IHOP and they said that they are planning to expand into Europe and beyond in the coming months. They have agreed to give your membership fully international status. Since you are not likely to be able to pick up your membership at one of the North American IHOPs which are equiped with card making facilities, they have asked me to forward a high resolution portrait of you so that they can make your card when they setup Willy’s and mine. Please forward me your photo ASAP and I’ll get this card in the mail for you. Your mail was noted, however I will try to get a portrait of myself and get it you as requested, but it will take a while because I am going for a serminar out of Ghana and will not be able to do that due to the assignment on my desk. Just keep me posted as usual with any development from your end. Again, I was kind of busy with some real work. So I had to keep Dr. Kofi hanging for a bit. How are you today? I am worried I have never heard anyword from you since our last communication. Please I know that you are very busy but try to always drop a note. I have given your contact details to the shipment agency should they contact you please let me know. How are things with you? The Trans Canada pedal truck trip is going well, but Willy and I are really looking forward to finishing. We figure we’re still on track to reach Vancouver by the end of the month. Fingers crossed. In other news, the police in Tallahassee, Florida have caught Samuel Banks, the guy who’s been using your passport number and a counterfeit IHOP lifetime membership card to claim free pancakes all over the southeastern United States. It turns out that Samuel is a minor and is therefore subject to an odd form of southern justice. Recognizing that the teen years are a critical time in a person’s development, experts are moving away from long prison terms for youth criminals and are instead adopting unconventional punishments. These often involve public events geared towards making the young offender feel ashamed of their actions. In the case of Samuel, they will be burying him up to his waste in sand and then throwing pancakes at him. The punishment will only last for 15 minutes and should not result in any long term physical harm, but a large crowd is expected and speeches will be made by representatives of all the affected parties. The primary plaintiff is Jeff Sousman, a line cook at the local IHOP. While he will be making a speech, he claims he’ll be doing most of his talking via a potato cannon loaded with buckwheat pancakes. The police also recognize that you have been violated through the fraudulent use of your passport number. They have asked me to get a statement from you that could be read at the event. Basically, they’d like you to express how it makes you feel that Samuel was walking around with your stolen identity. If you’d like to conclude your speech with a statement of forgiveness or some piece of wisdom to help steer Samuel towards a righteous life, that would be great, but it is totally up to you and I can understand if you feel nothing but scorn for Samuel at this point in time. The Pancaking event will take place on Saturday, November 27th, so the sheriff has asked that I get him your speech as soon as possible. I would really appreciate it if you could take a few minutes to put down some thoughts for this event. This is a very important part of the justice process. Perhaps this tale was getting a little too tall for old Dr. Kofi. This was his reply. How are you today? I read your mail and want to sincerely inform you that this was not my intention, I don’t think we can continue this investment because you are actually diverting my attention to a different ways which I will not have the time to follow you up on that. I am sorry if I have taken you far on this but I have to be frank and make do with the time available to me to do something better with my funds. I had to roll out the crocodile tears to get Dr. Kofi back in my corner. How am I today? I was fine until I got your e-mail! Now, I am deeply, deeply disappointed. I’m very sorry if you feel I’ve been diverting your attention in other ways. You seemed to be interested in this pedal truck trip that Willy and I have undertaken, so I shared with you a bit of our experiences. You would often e-mail me for updates, so I took that to mean you enjoyed hearing from me. I regret that this trip has kept us from initiating your investment proposal, but I thought that it was understood that we would get things started as soon as I returned home. As frustrated as I am, I guess I have to accept that this is your money and you are free to do with it as you please. I just wish I could have a second chance, because Willy and I would fly home tomorrow if there was anyway that we could salvage this deal. I’m not sure if I’ll hear from you again, but to show you that I appreciate the time you’ve spent with me so far, I’d still like to get you that IHOP lifetime membership. I just need your portrait to give to the people at IHOP. And of course, something will have to be done with the speech for Samuel Banks’ pancaking, but Willly and I can come up with something to submit on your behalf if that’s what you’d prefer. I hope that you’ll see it in your heart to give Willy and I a second chance. I hope to hear from you soon. I read your mail and I was actually moved with how you expressed your feelings in good fate, really the pedal truck trip you and your partner is working on interest me alot and how you shared updates with me transparently, made me to be well convinced beyond doubt that my funds will be safe in your hands for our proposed investment. Meanwhile, the IHOP and the speech that they want from me now made me to believe that you are just fabricating stories to waste my time which I don’t have to waste. my word is always my bond both in business and personal affairs and I don’t mix pleasure with business. If you are ready to work with me so that we can realize unparalleled success both now and in the future. when you travel back to your home how many days will you be to dedicate to this transaction so that we can conclude our transaction, or do I still wait till the end of month when you fully return? time is actually not waiting for anybody you know what I mean. I am personally looking forward to creating a prosperous enterprise for all of us. Thank you for being so accommodating. Rest assured, I’m not trying to fool you in any way. This has just been a crazy trip. Proof that truth is often stranger than fiction. Willy and I are in Castlegar, BC today. We are slated to arrive in Vancouver on November 29th and will be flying home on November 30th. There is nobody at home right now, but if there is anything I can do to get things rolling while on the road, I’ll happily do it. Just let me know. Meanwhile, I really don’t want to occupy too much of your time, so Willy and I will take care of the speech for the Samuel Banks event. If you could give us a few points to work into the speech, that would be great. We’re not sure how you’re feeling about that whole thing. I can certainly understand if you are feeling anger towards Samuel, but then again he is only a juvenile, so maybe you’ll have some uplifting thoughts to share with him. I don’t want to put words in your mouth, so I’ll leave it at that for now. Also, I don’t want to bother you again about the portrait, but if you could pass that on to us, it would give us a chance to send you a token of our appreciation. I only wish we had more to give you right now. Thanks for your mail to me, I hope you are well and OK? Basically the incident of Samuel Bank is annoying and I cannot understand why my passport as the first ID I gave to you which is very sensitive to me is attached to fraudulent issues.The best thing for me to do at the moment is to write a letter to the Ghana High Commission in Canada to attend to this matter before it becomes an issue that is capable of tarnishing my image.I need to be sincere with you at this juncture, I cannot send my portrait picture to you,if all goes well with our investment plan and funds come to you safely I will personally be in Canada then both of us can meet and I can give a recent portrait picture for the life membership with the IHOP. With respect to the Speech I would advise that you and your partner write it send a copy to me, I will go through it if there is any addition or subtraction I will do and send back to you. Furthermore there is nothing that we can do now until you get back to your home when you will have mobile number to be reached by the delivery agent that will bring the consignment to you in Canada. Alternatively I advise you to contact the delivery company with the information below, introduce yourself as the beneficiary of the consignment in their custody billed to be delivered to you in Canada. Please do send me update immediately you hear from them. I hope I have made the situation clearer should you have any question do not fail to ask. Thanks for your thoughts on the Samuel Banks speech and the explanation about the portrait. I’m excited to hear that you’ll be coming to Canada and look forward to meeting you. Willy and I have been logging some big miles lately, so we’re just getting caught up on e-mail now. We’ll contact the parcel experts today. Here’s the first draft of the speech we figured we’d send for the Samuel Banks event. Let us know if you’d like any changes made. A wise man once said that identity theft is a victimless crime, like punching someone in the dark. While this is a poignant quote, it is not always the truth. Good afternoon. I am Greg Kofi from Accra Ghana, I have a financial portfolio of $12.8 Million USD. I am a very busy man, so it is annoying that the first piece of ID I shared with one of my business associates in Canada turned out to match the passport number used by one Samuel Banks. I do not understand how such a sensitive piece of my identity could have fallen into such disreputable hands. However, I trust that the fine people at the Tallahassee Police Department will get to the bottom of this. I am also writing to the Ghana High Commission in Canada to attend to this matter before it becomes an issue that is capable of tarnishing my image. Although, I am furious that Samuel Banks has put my good name in jeopardy all for a few free pancakes, I am a gracious and forgiving man. At the moment, my focus is on developing a partnership with a Canadian firm to construct the largest bicycle theme park in the world. When the park opens, I would like young Samuel to come and see what can be accomplished with a little hard work and an honest approach to business. Samuel, today you have been given a second chance. You have your whole life in front of you. To spend another day committing crimes, even victimless crimes, would be a waste. Good luck Samuel and Godspeed. I’ll keep you posted on what I hear from the shippers. Please let me know your thoughts on the speech. Thank you very much for your mail, I read through the speech and added some lines well its ok, I will not be chanced to check my mail tommorrow until late in the evening as we shall be going to inspect and commission a housing Estate built by the government of Ghana outside Accra. Best regards to you and Willy your partner. Dr. Kofi’s amendments are in red. Good afternoon. 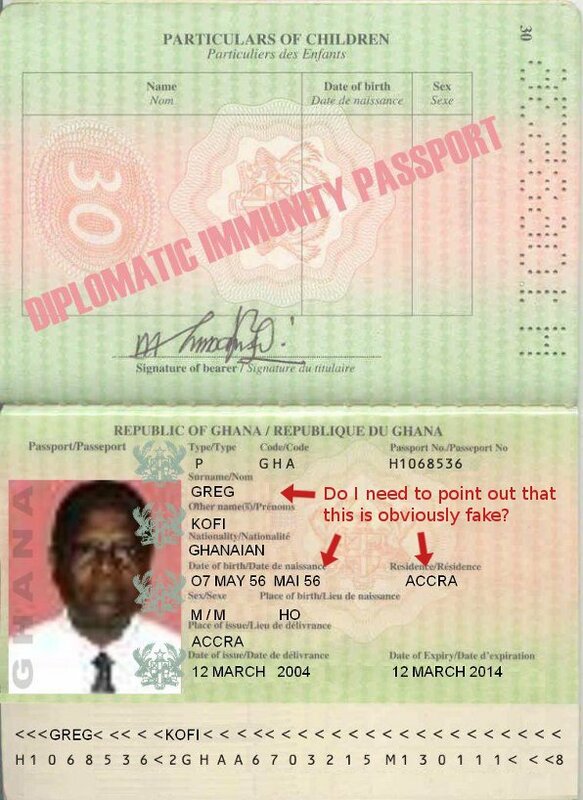 I am Greg Kofi from Accra Ghana, I have a lovely wife and two adorable kids the name of my first child is Charles and the second is Chelsea, I am a very honest and strict businessman, so it is annoying that the first piece of ID I shared with one of my business associates in Canada by name Brent Curry (Mr.) turned out to match the passport number used by one Samuel Banks. I do not understand how such a sensitive piece of my identity could have fallen into such disreputable hands. However, I trust that the fine people at the Tallahassee Police Department will get to the bottom of this. I am also writing to the Ghana High Commission in Canada to attend to this matter before it becomes an issue that is capable of tarnishing my image. As per Dr. Kofi’s request, I wrote to the Parcel Experts to arrange for the shipment. This is the response I got. Sequel to the authorization issued by Dr.Greg Kofi, making you the assigned beneficiary of the consignment valued at US$12.8Million. 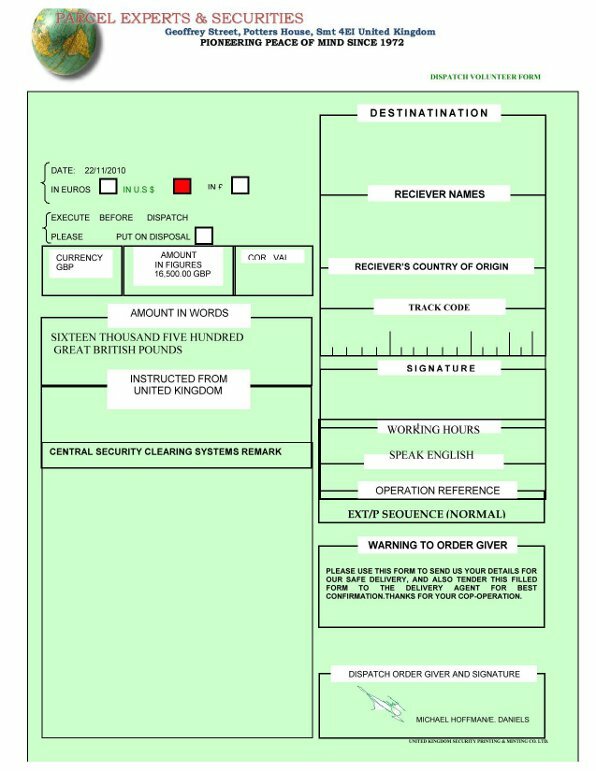 I write to inform you that we have begun arrangements to deliver this your consignment to you, For us to obtain clearance and insurance certification on your behalf as the duly assigned beneficiary, you advised to download the attached dispatch form and fill it correctly and send back to us with a copy of your Identification. Furthermore, the management of this company wish to inform you that immediately we recieve this information accordingly, the consignment will be dispatched to you respectfully upon meeting the requirements. Kindly get back to us or call the undersign telephone number for clarification. Before responding to Mr. Divine, I had a few concerns I thought I better share with Dr. Kofi first. Thanks for getting back to me with the revisions for the speech. It looks great. I just received an e-mail from James Divine at the Parcel Experts. I was shocked to discover that the shipment is going to cost £16,500.00. That translates to $27000.00 Canadian. Am I supposed to pay this myself? I don’t have nearly that much money available in my savings. Another thing that I found disconcerting was the form I was asked to fill out. There were numerous spelling mistakes. For example, “RECEIVER” was spelt “RECIEVER” in two places and at the end of it all, I was thanked for my “COP-OPERATION”. Have you actually dealt with these people before? I’m sorry to be such a stickler, but I think it’s important, both for your sake and mine, that we take every precaution to ensure that our money is safe along every step of the way. I hope that your wife and Charles and Chelsea are doing well. Looking forward to hearing your thoughts on this shipper. How are you doing today? I am fine and very tired from the days encounter. I read your mail and noted your points, definitely I can understand your fears about the safety of my funds and our proposed investment. However I am not in support of the error because personally I strive for excellence, What do we do? we cannot stop arrangement because of that blunder. Please forward copy of the mail and the form to me so that I can also see what is written. With respect to the cost of shipment, I am going to speak to a friend of mine to pay the charges. what I want you to do is to get back to the company and request the mode of payment so that I can forward it to my friend ASAP. Brent, my wife and children are fine and doing great. I hope you are also in good health. I await your quick reply and the payment information from the shipper. I responded to Greg right away. I wasn’t about to drop my issue with this dodgy shipping company. Here is the form that was sent to me by the supposed Parcel Experts. As I said, it seems fishy that they’ve been Pioneering Peace of Mind Since 1972, yet they can’t get the spelling right on a basic Dispatch Volunteer Form. I’m reassured that you’ll be able to get your friend to cover all the charges. However, I still think we should exercise caution when dealing with this company. I’m glad to hear that your family is doing well. Tell me more about this encounter you had today. It sounds frightening. And I wasn’t going to stop there. I figured I’d play the scrappy lieutenant and make it clear to this James Divine character that Dr. Greg Kofi does not mess around. Thank you for sending me the Dispatch Volunteer Form. Dr. Greg Kofi is a serious business man who strives for excellence. He does not suffer fools gladly. Therefore, as one of Dr. Kofi’s trusted business associates, I must insist that you resend me a proper form, one that is not rife with spelling errors. Furthermore, I cannot agree to send you my ID until you have provided a copy of your own ID. Let’s just say I have some serious doubts about the veracity of this business enterprise of yours and I will not tolerate any mistakes that could jeopardize the success of Dr. Kofi’s investment proposal. Here is to inform you that I received your mail, I have carefully studied the dispatch form, without mincing words I appreciate your corrective message and sincerely apologize for the spelling errors noted on the dispatched form that was sent to you. However Parcel Experts is a small private firm that undertake task from various individuals and have not had any problem discharging our obligations. Sir, it is againts our internal regulatory body to send you my ID card. You are free to come to our office in London UK presenting a signed letter from Dr. Greg Kofi to sign the P.O.D (Proof Of Delivery) document and have the consignment released to you. Should you be able to come down. Do send us email to enable us book an appointment with you to that effect. Alternatively fill the form that was sent to you and get back to us with it, be assured that corrections have taken effect from this moment and we hope to serve you better to the best of your wish. I sent a quick response, demanding a copy of the revised form. I also shared my concerns with Dr. Kofi. Thanks for the mail to me and the forwarded copy of form the delivery company sent you. Actually I had to communicate the mistake made in the spelling to them this morning that my associate Brent Curry is doubting their credibility that as a firm operating for such a long time (since 1972) could make mistake that is capable of dropping their reputation down to zero level. Be it as it may, the officer in charge apologized to me and said they will send you email also to apologize for the error and make the necessary rectification. Have you heard from them? Brent, I really appreciate your concern about being cautious here because any misinformation can lead to partial or total loss of the funds and what we have been working for will be in absolute stalemate due to negligence. I was introduced to this firm by a friend his name Amissah that this parcel expert are good at undertaking private services on a contigency basis, that was why I want to employ their services in making the delivery to you peacefully. At this juncture, I will like you to get in touch with them and make the necessary arrangement get the payment information and get back to me, you know this period I do not want my friend to give me excuses that he cannot pay that he has spent money this will make this transaction move to next year. In Ghana we do not have access to send money out I would not have informed him about this arrangement. I hope to hear from you soonest till then remain blessed feel assured and partnered. With a little more prodding, I got the following response from Mr. Divine with the requested changes made to the form. Sir, be informed that we have other clients that needs immediate attention and it is our duty to satisfy all our clients equally. Find attached to this mail the dispatch form, kindly fill and return it to enable us get the shipment arranged. After completing and returning the form, I also heard from Dr. Kofi. How are you today? everytime I read your mail I feel so anxious to meet you face to face, you are the type of man that I am looking for. now I understand the essence of your SAVE THE MARPLE TREE. I am impressed with the way you are taking this matter personal it goes to show that our relationship will be a lasting union. My brother and friend, I trust the use of your discretion in this matter just handle it and make sure you keep me posted with all development as usual. I await to hear from you and do not forget to get the payment information from them so that I can send payment through my friend. Please send me your mobile number I need to talk to you. BANK OF CHINA (HK) LIMITED. BRANCH:136 SAN FUNG AVE BRANCH. You are advised to immediately scan and send to us the payment transaction slip for confirmation and also to enable us meetup with the appointment with Cosco Shipping as scheduled. The delivery date and clearance documents will be sent to you after the conclusion with Cosco Shipping either by email or regular mail. Thank you for engaging our services, we deliver at your doorstep. I passed this info on to Dr. Kofi and asked how his friend was getting along putting together that £16,500.00. How are you today? Thanks for the forwarded mail, I have sent the payment details to my friend this same time so that he can get it done by tomorrow. I pray he does it very early so that I can forward to you ASAP. Many thanks for your effort. how is the pedal trucking trip going? Things have been going well with the trip. It’s getting a lot colder these days. Winter is definitely on its way. This afternoon, we had a bit of a setback. A road washed out in the mountains just west of Princeton and we couldn’t get through. I’ve attached a photo of the damage. We had to hitchhike back into town. We’re spending the night at the Ponderosa Motel which is pretty nice. Hopefully, they’ll have the road dug out by tomorrow and we can carry on our way. Still hoping to make our flight home on the 30th. 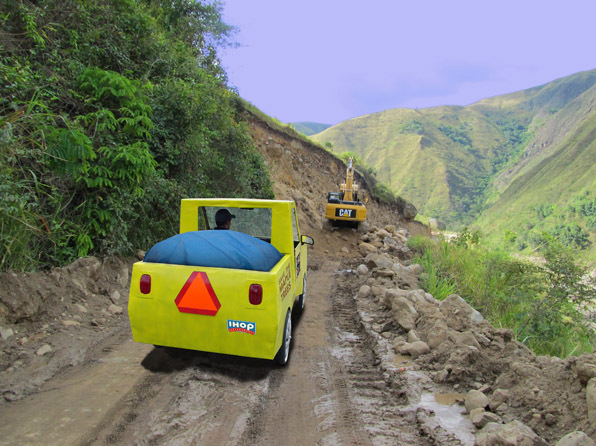 This photo, minus the pickup truck, was actually taken by Nat Faulkner on his cycling trip across Colombia. Let me know how things go with the payment for the shipment. How are you today? I saw the picture of the washed road, this is just another encounter after the one you had riding through the bear country. I pray that God will grant you safe trip riding and flight back to your home. My partner and friend, there is a little problem with the payment, my friend was not able to pay the total 16,500 GBP, he explained to me that his financial situation is extremely tight. On checking his commitments he won’t have any spare cash, He said this is Christmas time and all his money for December is taken up with usual costs plus a few luxuries for Christmas. However he was able to assist with 14,000 GBP. and the payment slip is attached to this mail. I am actually sorry for bringing this financial burden on you because we did not bargain for it and I also want you to know that if I have my way I would not have asked you to contribute a dime. 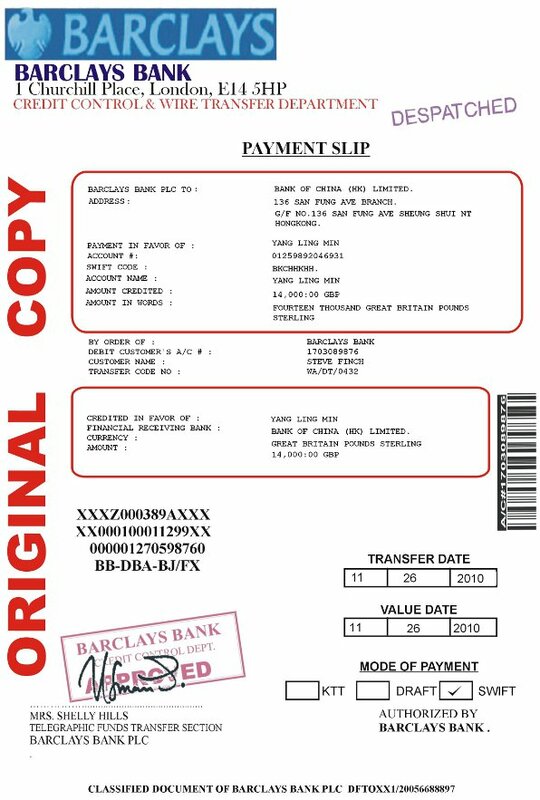 But this is where I need your sincere and honest support to finally conclude this transaction, Please try and pay the balance 2,500 GBP attach the two payments slip and send to the shipper, state it clearly in your mail that it is two payments slip made to the account they provided and the amount on each slip. kindly send a copy of your payment slip to me also as a record. I assure you that your money will be remunerated back immediately the shipper releases the consignment to you in Canada. my word is my BOND. It is my earnest desire to meet with you within few weeks, this is my number and the time you will be able to get me on phone:+233268441099 call me 10PM. I await your positive mail. Dr. Kofi wrote again the next day, but of course I was in the midst of my imaginary charity bike ride, so I had to leave him hanging a bit. In his follow-up e-mail he asked how my trip was going, so I filled him in. It’s good to hear from you. Willy and I are doing well. We got past the washout yesterday and are starting today’s journey from Manning Provincial Park. I’m sorry I didn’t get a chance to respond to your last e-mail. Willy and I just can’t agree on how we should go about raising the money needed for the transfer. It would be nice if we could dip into the money that was raised for the Maple Forest Defence fund. Unfortunately, that’s controlled by a foundation that will not allow us to withdraw any of the funds. It seems like we’re just going to have to start fresh with a new money making idea. Willy and I are both pretty burnt out from our current trip, so it’s hard to get really excited about new money making schemes. The bicycle rickshaw season is pretty much over in Kitchener. I heard they got a couple of inches of snow last night. I could still take my rickshaw out when I get home, but it will be hard to find customers willing to ride when the weather is so cold. Willy is a tightrope performance artist. He’s been trying to think of a stunt he could do when we get home. He’d like to ride his bike across a tightrope somewhere. Ideally, the rope would span some dramatic landscape, but it’s equally important that we do it somewhere we can count on there being a large crowd. I’m thinking a hockey arena between periods at a major game. Willy wants to do it across the rafters at some fancy restaurant, but I’m worried about debris and things falling into the food. Sometimes, I don’t think Willy keeps his stunt bike, costumes and trained animals as clean as he should, which can be a problem during public performances. Do you have any ideas? We’d definitely respect your opinion in all of this. Sorry for the rushed e-mail. We’ve got to get back on the road. Vancouver is getting close. We can almost taste the finish line. Thanks for emailing me, I am happy to hear that you and your partner are fine and doing well and has gone past the washout. Brent, I really appreciate your effort in getting the balance funds needed to conclude this arrangement, as you definitely know that time is of great value to me and you. At the moment I don’t have any idea how to do this because the only friend I counted on has done his part. what I have to say here is that as my partner considering what we have and knowing what lies ahead of us you will be able to raise the balance to conclude this arrangement. I am saying this because if you and Willy could come to agreement to raise the money, if it means to borrow from the Maple Forest Defence fund. I have given you my word that I will pay back immediately the shipper delivers the consignment to you. This is simple because you will be in your home by 30th as you have told me and immediately you transfer the balance and send the two transfer slips to them, I am sure the shipper will not delay in the delivery to you. I regret bringing this burden on you but it is something that we can resolve with actionable ideas without any adverse consequences on the both of us. I beg you my friend with anything you hold sacred to try and put the balance together and send to the shipper further delay might not be helpful to our course,let us not end in stalemate because of just 2,500 GBP.this project has been lingering on and this is where we scale the very big hurdle to conclude it.I think it is timely because you are also rounding up your pedal trucking trip to start our investment plans. Remember nothing good comes easy. I happened to be quite busy with real work at this point, so I did not respond, but the e-mails kept coming from Dr. Kofi. How are you doing today? just want to know if you have transferred the balance to the shipper. My good friend we need to wrap up this arrangement this week. that is why I want you to put your best with all assurance that you will never regret partnering with me. What is the position with your trip? and your plans back to Canada? I hope you are well and OK? it is very unusual that I did not hear from you for few days now. I begin to worry if something terrible has happened to you on your trip or have you changed your mind about our pending investment because of the funds needed to conclude with the shipper?? I am unable to know your position if you have made the transfer to the shipper. Please email me back I am completely in the dark as regards your silence to my several mails. We need to conclude this arrangement and I am counting absolutely on you to support in achieving this goal that we have set for ourselves. Today is 30th that you promised to be in your home and I have not heard from you, If you have changed your mind about this transaction why not email me so that I can move on with my life than keep me in absolute silence and worries? I still hope to hear from you about your position on this transaction. I’m sorry for the lack of e-mail. The last few days of our trip were extremely hectic as we struggled to make our deadline. Yesterday, when we arrived in Vancouver, I was blown away by the reception we received. There must have been thousands of people crowding into the streets and all of them seemed to want to shake our hand or get their photo taken with us. I’ve attached a photo of the mayhem. I had always looked forward to finishing our trip, because I expected that I’d finally be able to relax. Boy, was I wrong about that. Yesterday, there was never a spare moment as we were whisked from one media interview to the next. Today has been a full day of travel. I just got in the door an hour ago, which is why I have not been able to contact you until now. As I mentioned earlier, we do not have any authorization to withdraw money from the Maple Forest Defense Fund. Therefore, Willy and I will have to start a new fundraising campaign tomorrow. Willy is pretty gung-ho on doing his tightrope cycling act and figures he can bring in some good money if his stunt goes according to plan. We’ll keep you informed as our plan comes together. Now, for some much needed sleep. Thanks for getting back to me, I thank God for your safe arrival back in Vancouver. I am thrilled by the powerful and exciting reception from the people of Vancouver to you and your partner Willy its a beautiful one. Brent, I don’t want to bore you with so many words. My advise at this point is for you to send mail to the shipper that you are working on getting the funds transferred to them. You said you and Willy will start a new fundraising campaign tomorrow, are you raising this funds for the Marple Forest Defense? or to use part of it to clear the standing charges for the shipper to conclude the shipment of the consignment to you in Canada? Please, get back to me with your position on this and sincerely let me know when you will be able to transfer funds to shipper. my funds are just tied down there without returns and I need to repay back my friend because I told him that in few days I will return is money back and show appreciation. I wish you all the best and looking forward to creating a prosperous enterprise for all of us. Now you can give me your mobile number so that we can talk. God bless you and sweet sleep. How are you today? I am sure you are doing much better. well I was expecting a quick response from you to let me know the purpose of the fundraising program you and your partner Willy are starting again, is it to clear the balance 2500 GBP or someother purpose? according to the saying “where your treasure is there lies your heart ” I am not having sweet sleep because of this pending transaction. I did not mean to bring this burden on you, but you seem not to understand the magnitude of this transaction and the need to resolve it as fast as possible. I know what I am talking here because if you are dedicated to this course, it should have been completed and the deposit in your possession for our proposed investment. Please let me know when you will be able to transfer the balance to the shipper, I have promised to pay you back. if you are not ok with that. get back to me ASAP. I can as well write a reassignment letter to the shipper to stop further process. if you are sure to proceed send an email to the shipper that you are making arrangement to get the funds transferred. Brent, your quick and positive response will be highly appreciated. I also need your mobile number that you can be reached incase I need to speak with you. I’m sorry I haven’t written in a few days. Something awful has happened. I don’t know how else to say this, so I’m just going to spit it out. My good friend Willy died the other night trying to perform a cycling stunt at a local restaurant. I’ve attached the newspaper article to explain what happened. Anyway, Willy was performing the stunt in the hopes of earning part of that £2500 we need for the shipping fees. Obviously, this stunt was a bust, and now I’ve lost my partner so I don’t know where I’m going to come up with the money. I don’t think I can really deal with this right now. It would be nice if there was someway you could put a hold on that shipment. I’m going to e-mail the shippers now and tell them that I don’t have the money. I’m sorry to let you down on this, I’m just too overwhelmed at the moment to think about anything else. If there’s anyway we can put off this deal for another week or two, I would really appreciate it. I still think we could have a bright future working together. I thank you alot for keeping me waiting, I thought you are genuine not knowing you are just playing games to waste my time. I have to look for someone that will be able to handle this transaction and write a reassignment letter. Immediately I will let you know that this portfolio is out of your hand. You are currently browsing the Bicycle Forest Blog weblog archives for December, 2011.